I play football and one day in late August 2007 at practice my left foot got stuck in the field turf as I was turning and preparing to jump. This completely tore my ACL and partially tore my MCL and lateral meniscus. 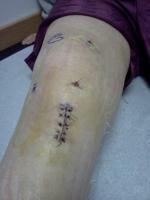 I had surgery to reconstruct my ACL and fix my meniscus in early October 2007. The surgeon used one of my hamstring tendons and after the surgery he said everything went really well. After the surgery I did everything I was asked and worked very hard to rehab my knee and since then my MCL has healed completely and my knee has progressed nicely. When I saw my surgeon back in April (roughly six month checkup) he was very pleased with how the ACL and knee in general was healing and progressing and said he didn't need to see me again until the one year post surgery mark. He did prescribe an ACL brace though which I have now and wear when I run routes (I play receiver) or have the possibility of getting hit. I then went and saw my physiotherapist who suggested rest which relieved me of virtually all of my symptoms except for the last one: the pain and clicking on the lateral side of my knee. My PT then treated me for IT Band problems as well as tight hamstrings using acupuncture, ultrasound, etc. I continued seeing my PT five days a week for roughly two and a half weeks. This helped to cure the pain and slowly reduced the clicking but unfortunately my PT went on vacation last Wednesday and the pain on the lateral side on my knee has returned. The strange thing though is I don’t have the clicking anymore. Just a lot of pain which is making it hard to train for Football. One thing I have noticed is that a tendon (I believe it is a tendon) just below my kneecap to the lateral side is swollen and I believe that this may be the cause of the clicking or popping. So as of now I am a little confused with what to do with my knee. I can’t take time off because we start training camp in roughly a month but the pain is enough to slow me down considerably right now. So I was wondering if you may possibly know what is causing this pain on the lateral side of my knee and what I can do to get rid of it for good? Ps – I apologize for writing so much. I hope that it helps in some way.